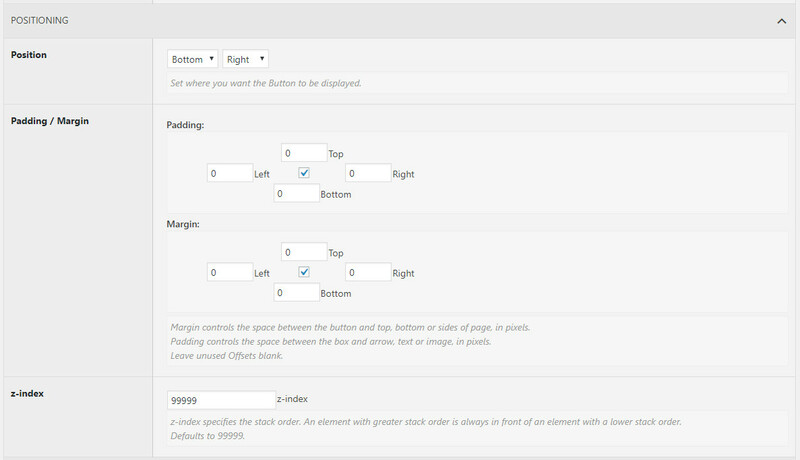 You can enable or disable the Back to Top button on the entire website. You can also show the button in the Back to Top Settings page. Choose which of the Standard Pages of your website you would like the button to display on. Controls whether or not to show the button on ALL Post Pages. Choose the arrow type from 40 different arrow icons. the Font Arrow settings controls the arrow icon size as well as the text option. The Font/Arrow Color setting allows you to control the color and hover color of the arrow or text. 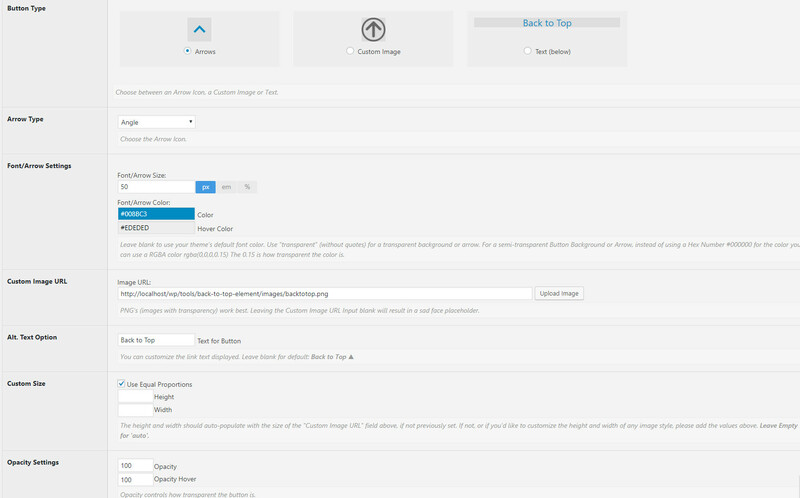 If you choose to use a custom image, you can upload an image or use the default one. PNG's (images with transparency) work best. The Alt Text Option allows you to have alt text for the arrow icon, or image, and also controls the Button Type text option. You can control the height and width of the button. This setting also controls the size of the Button Type Custom Image option. The Opacity Settings controls how transparent the button is, and when you hover your mouse over the button. Controls background color and the background hover color of the button. Controls the style of Border Radius. You can choose Square, Rounded Square, Round or a Custom setting. With the Border Size you can choose to have a border, and control the size or use 0px for no border. This controls the thickness of the border. The Border Style allows you to choose from: None, Dashed, Dotted, Double, Groove, Ridge, Solid, Inset or Outset. 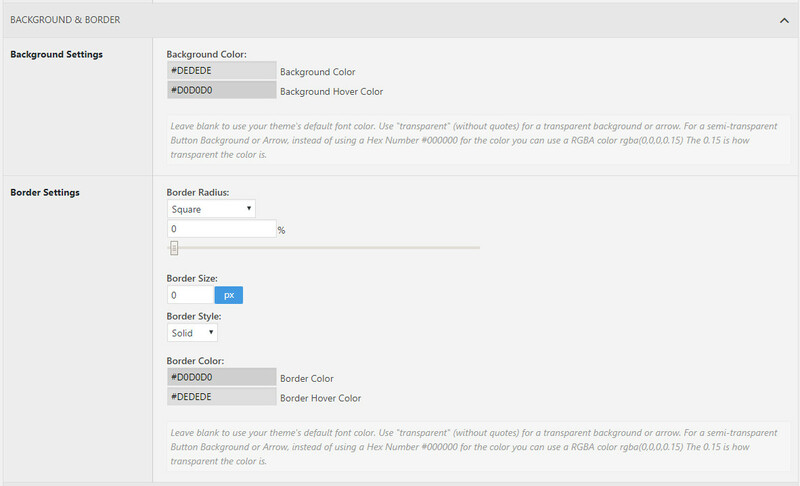 Border Color allows you to change the border color and the border color when you hover the mouse over the button. The position setting allows you to position the button on the page either to the Left, Center, Right, Top or Bottom, or a Custom Offset. Padding controls the space between the button and the icon, image or text. Marging Controls the space between the button and the bottom and sides of the page. You can adjust the size of the Font or Arrow and also the width for when the setting is applied for Tablet sized devices. You can adjust the size of the Font or Arrow and also the width for when the setting is applied for Mobile Phone sized devices. You can hide the button for devices smaller than the pixel setting you choose. If left empty, the button will display on any size device.